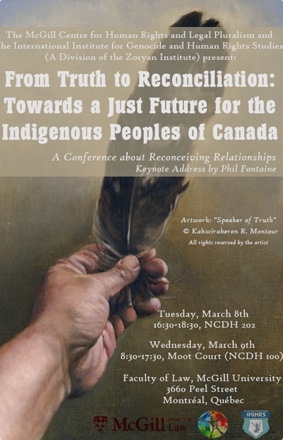 MONTREAL – A conference sponsored by the Zoryan Institute was held March 8-9 at McGill University’s Faculty of Law to examine the recommendations of the Truth and Reconciliation Commission and possible ways to implement its findings. Titled “From Truth to Reconciliation: Towards a Just Future for the Indigenous Peoples of Canada,” the event was an initiative of the International Institute for Genocide and Human Rights Studies (A Division of the Zoryan Institute) in partnership with the McGill University Centre for Human Rights and Legal Pluralism. The conference approached its subject from a legal, political, cultural and social perspective. The gathering attracted a wide variety of participants, including academics and activists, while the audience comprised a wide-cross section of society ranging in ages, including many Indigenous people. The two-day conference underlined the well-known advice that those who don’t learn from history are doomed to repeat it. Greg Sarkissian and his team at the IIGHRS are doing their best to make sure that warning is heeded. “Our mission is to educate,” explained the Institute’s president as it recently spotlighted the report of the Truth and Reconciliation Commission into abuses against Canada’s Indigenous population. Sarkissian hopes that with more knowledge will also come greater prevention of atrocities in the future. David MacDonald, a University of Guelph professor who participated, noted Canada has recognized five genocides, including the 1915 Armenian genocide and the Second World War Holocaust. It described its treatment of First Nations children in residential schools as “cultural genocide.” “Does it make a difference if it’s UN (recognized) genocide or cultural genocide in terms of Canada?” said MacDonald. “I think it does. I think you would then be looking at a real need for land claims and other issues to be resolved quickly. Canadians could see in a real way that these are very serious issues.”For many Indigenous people, land does not correspond to property or ownership, but is rather something to be shared. They also view land as a broader concept that not only provides a place to live but serves as a teacher of how to conduct relationships and build character. 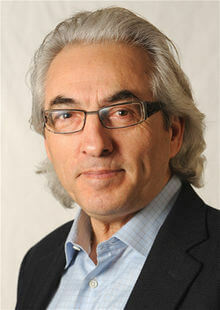 MacDonald said Canadians pride themselves on their human rights record and sometimes deflect criticism by saying Canada treated its Indigenous people better than the Americans, denying the trauma inflicted by the Indian residential schools until the late 1990s. Compelling keynote speakers were also part of the conference and included Phil Fontaine, a former national chief of the Assembly of First Nations, and Chief Doug White, an accomplished aboriginal lawyer from British Columbia. Fontaine, a tireless advocate, was among the 150,000 aboriginal, Metis and Inuit children who went through the reviled church-run residential school system that operated from the 1800s to 1996. He said it took him most of his life to recover from the assimilation attempt. The lively debate and touching personal stories related by speakers and audience members illustrated the Institute’s efforts to spark understanding among all ages – but particularly the young – about the issues surrounding genocide. The conference is only one of the educational initiatives being undertaken by the Toronto-based Institute, a part of the Zoryan Institute. 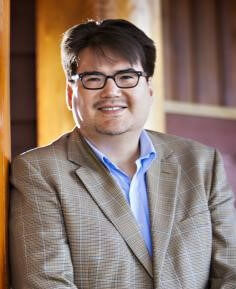 Its two-week program on genocide and human rights will start Aug. 1 at the University of Toronto. The program has attracted participants from 40 countries since it started 15 years ago and will accept applications until May 31. The Institute also carries out extensive research. 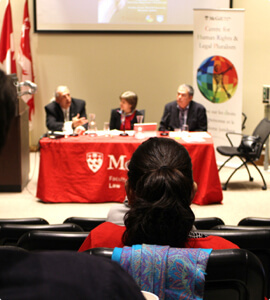 The McGill Centre for Human Rights and Legal Pluralism, which celebrated its 10th anniversary in 2015, aims to deepen transdisciplinary collaboration on the complex social, ethical, political and philosophical dimensions of human rights. From its inception, it has concerned itself with the place of Indigenous law in the Canadian and international legal orders, as well as the recognition of the equal dignity of Indigenous people.